It can be surprising to see leaves clinging to deciduous trees in mid-winter. 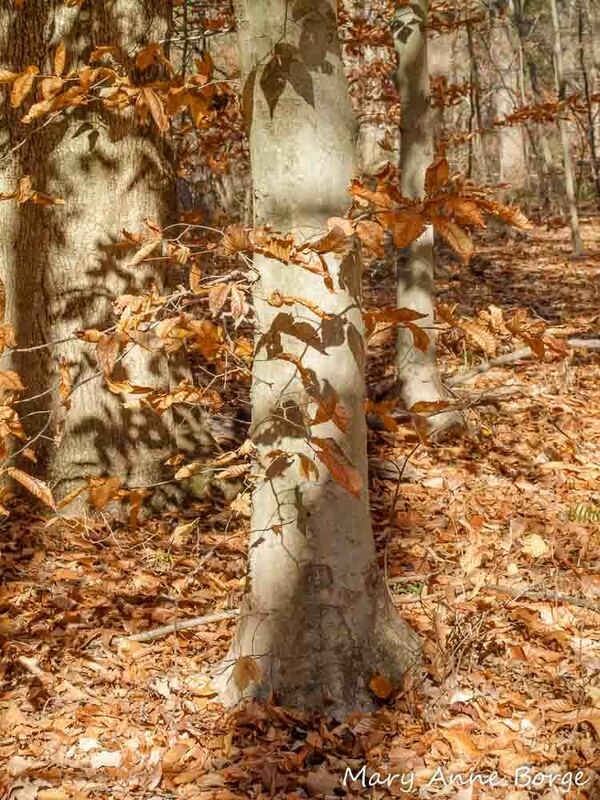 In eastern North America, some oak species and American Hophornbeam (Ostrya virginiana) may retain their leaves but American Beech (Fagus grandifolia) trees are among the most conspicuous to do so. By January its leaves are bleached to a papery pale tan, catching the bright winter light while fluttering in the winter wind. The leaves look delicate, but give one a tug and you’ll see how tenaciously they adhere to their branches. 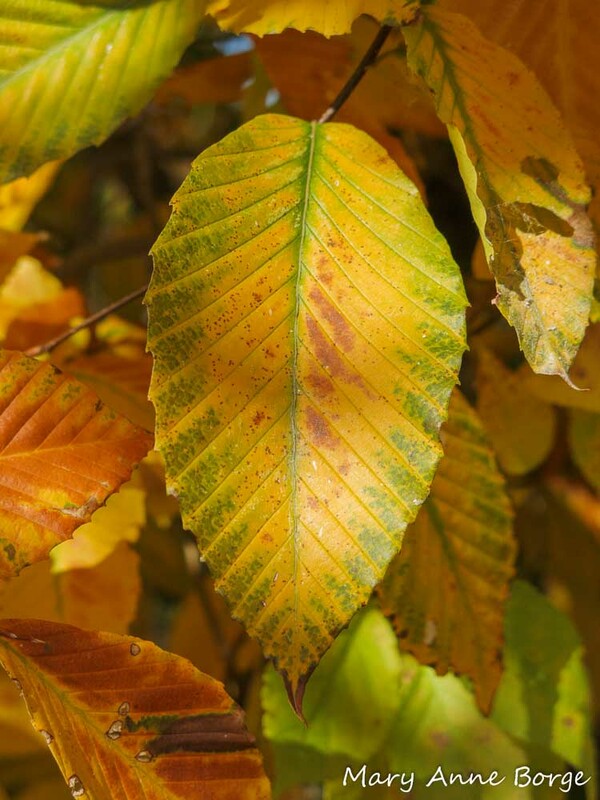 American Beech leaves typically stay on the trees until early spring, withstanding the effects of even ice and snow. 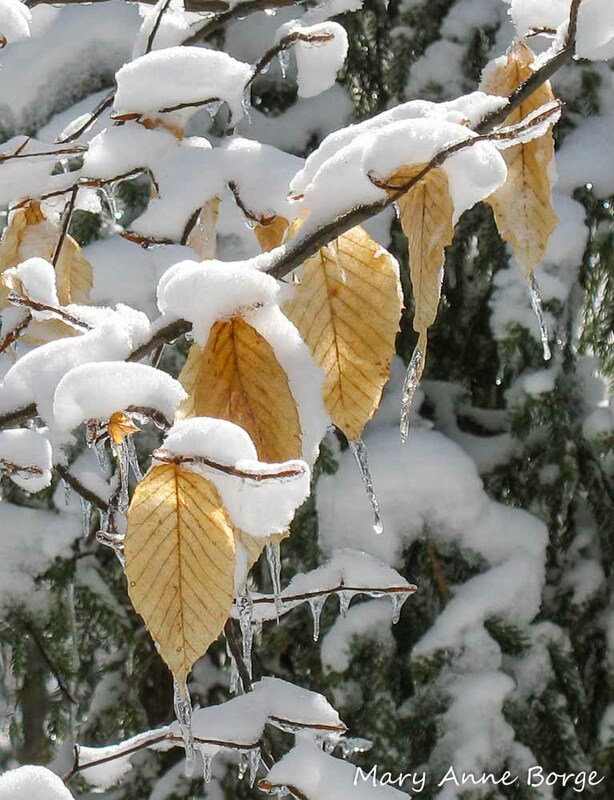 Why do American Beech and other trees keep some of their leaves in winter? There are many theories: the dry leaves may be a deterrent to winter browsing by deer, moose and other mammals; holding some of the leaves until spring may be the trees’ way of time-releasing some nutrients for recycling into the soil; the leaves may funnel more snow melt to the tree’s root system. But no one knows for certain what caused this trait. The smooth, pale gray bark is an unmistakable characteristic of American Beech, often tempting passers-by to carve their initials. 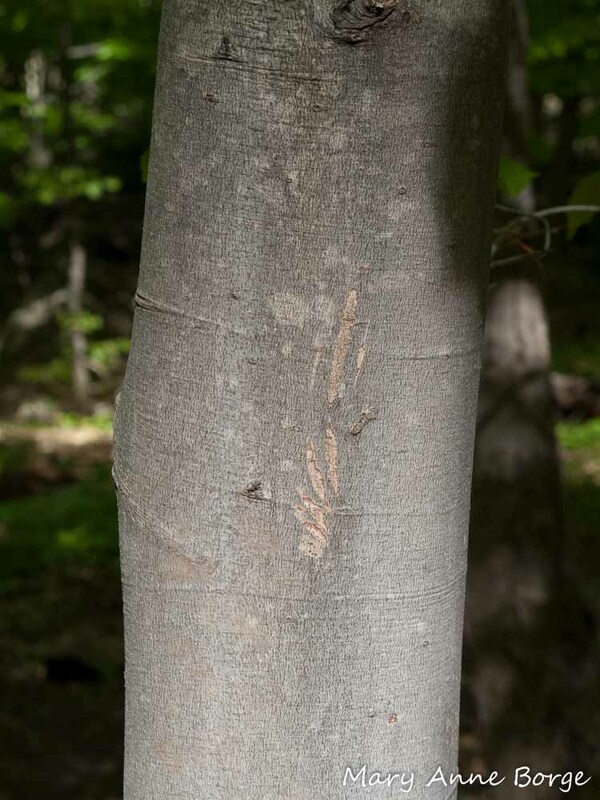 A more interesting possibility is a sighting of animal ‘tracks’ – claw marks from animals that may have climbed the tree at some point. Trees are susceptible to frost cracks in winter, caused by warming from the low-angled rays of the winter sun, followed by rapid cooling when the sun sets or disappears behind a cloud. Both the bark and the wood it encompasses expand in the warm sun, but the bark may cool more quickly than the wood when the sun disappears, causing lengthwise cracks to occur in the bark. If temperatures are warm enough, portions of the inner bark may become active, only to be killed if a rapid refreeze occurs. American Beech evolved to minimize the harsh effects of the sun by having light-colored bark that reflects the sun’s rays. 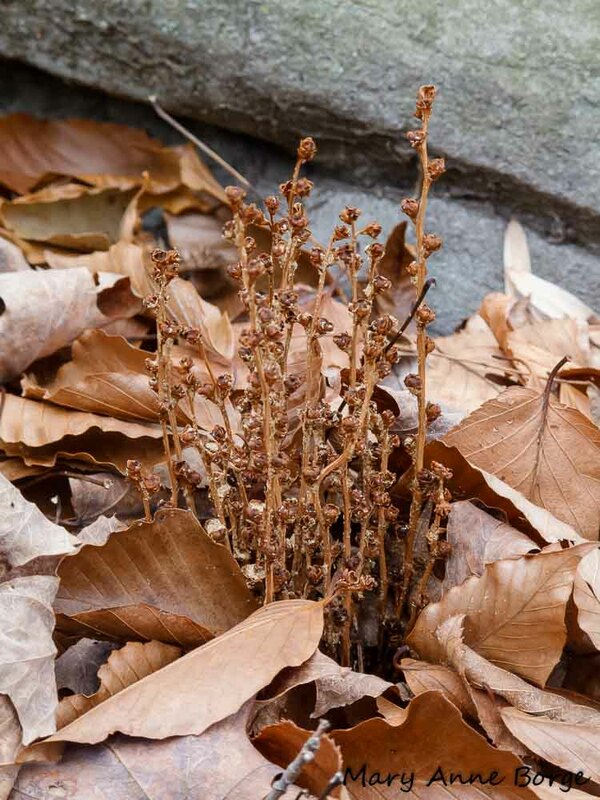 The winter leaves may provide an additional layer of protection from the warm sunlight. 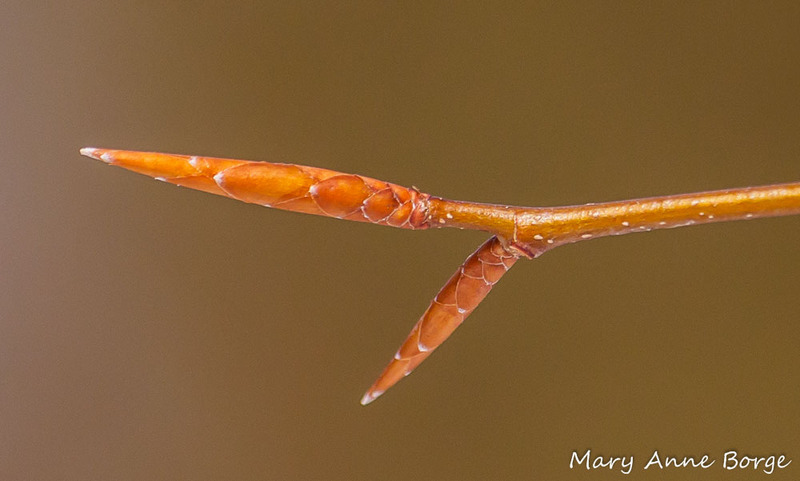 American Beech’s long, sharply pointed copper-colored buds are another distinctive winter identification feature. As spring approaches, American Beech buds grow longer and plump, eventually opening to reveal newly unfurling leaves, accordion pleated and hairy as they first emerge. The long silky hairs are an adaptation to make the new leaves less appealing to the many species of hungry caterpillars and other insects that may eat the leaves later as the hairiness dissipates. 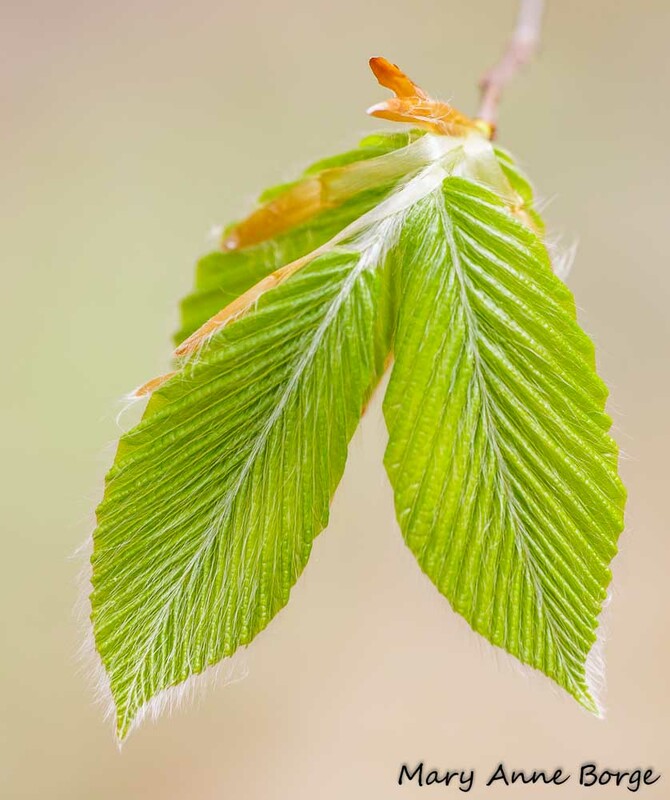 According to Bringing Nature Home by Douglas Tallamy, American Beech provides food for the caterpillars of over 100 species of butterflies and moths. 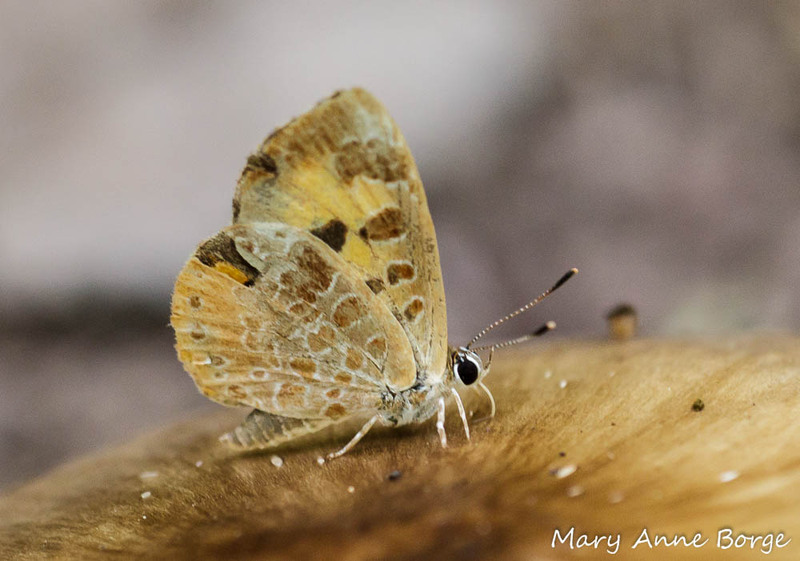 Among them is the Early Hairstreak butterfly, a rare species found in deciduous or mixed woodlands from the maritime provinces of Canada to northern Michigan and Wisconsin through the Appalachians to Tennessee and North Carolina. 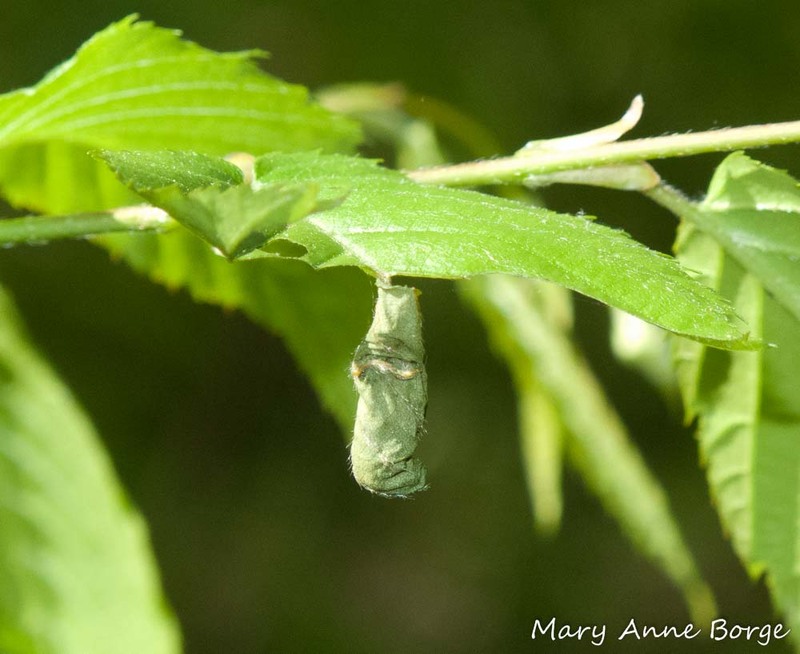 Early Hairstreak caterpillars can only eat the leaves of American Beech and Beaked Hazelnut (Corylus cornuta). The presence of caterpillars attracts predatory insects and arachnids to feed on them, including many species of spiders, wasps, ants and flies. 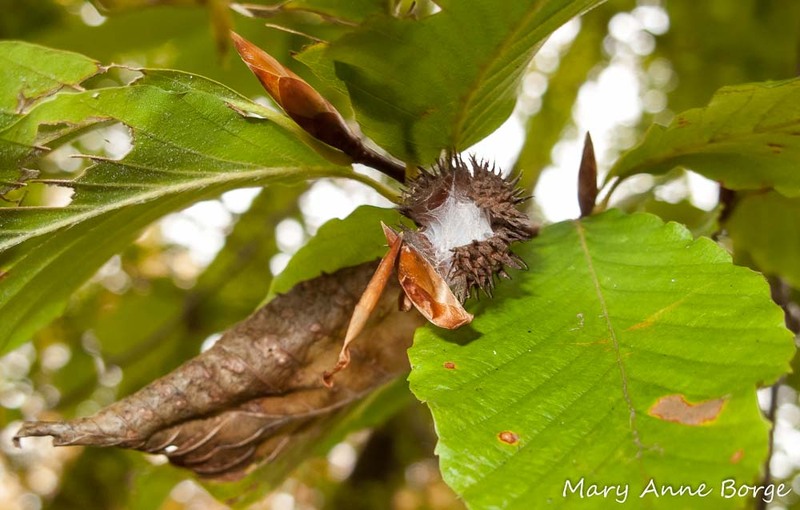 These insects are beneficial to the trees, because they help keep the caterpillar population in check. 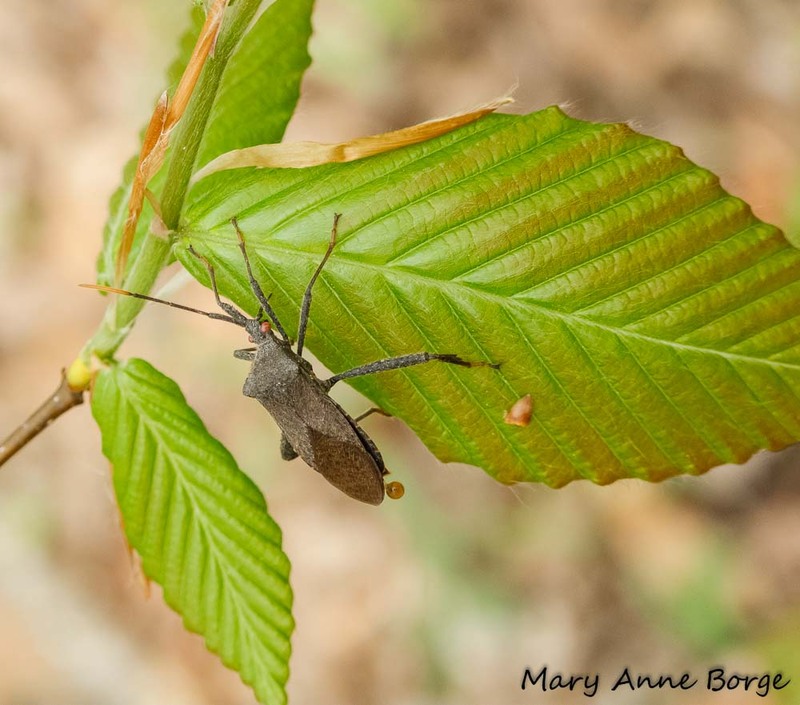 The Woolly Beech Aphids’ honeydew in turn attracts other insects who eat it, including wasps and ants. 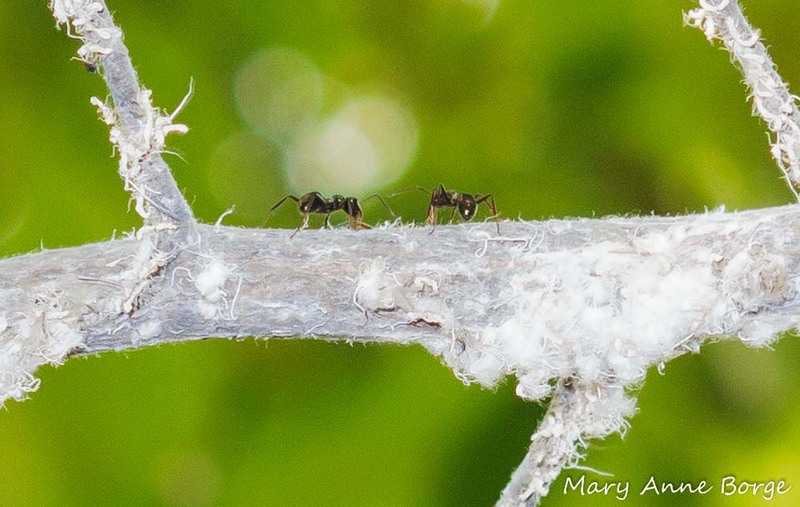 Ants help protect the tree from the insects that feed on its leaves, by aggressively attacking them. The Harvester butterfly also feeds on the Woolly Beech Aphid’s honeydew, although its first choice is Wooly Alder aphids. The Harvester’s caterpillars eat the aphids themselves. 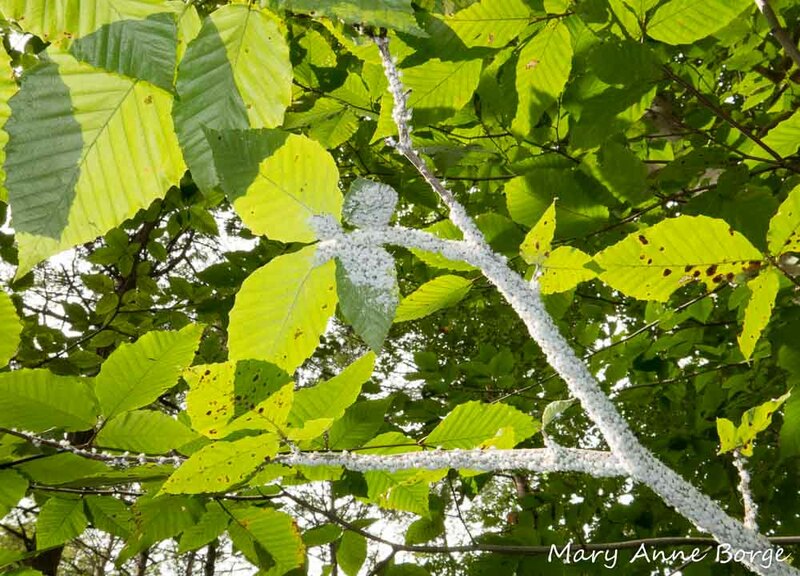 A non-native scale insect (cryptococcus fagisuga) introduced through the nursery trade on European Beech threatens the health of American Beech by providing an opening in the bark that together with a fungus enables beech bark disease. This is a good example of the importance of using native plants in your own garden, and the danger of using introduced exotic plants. 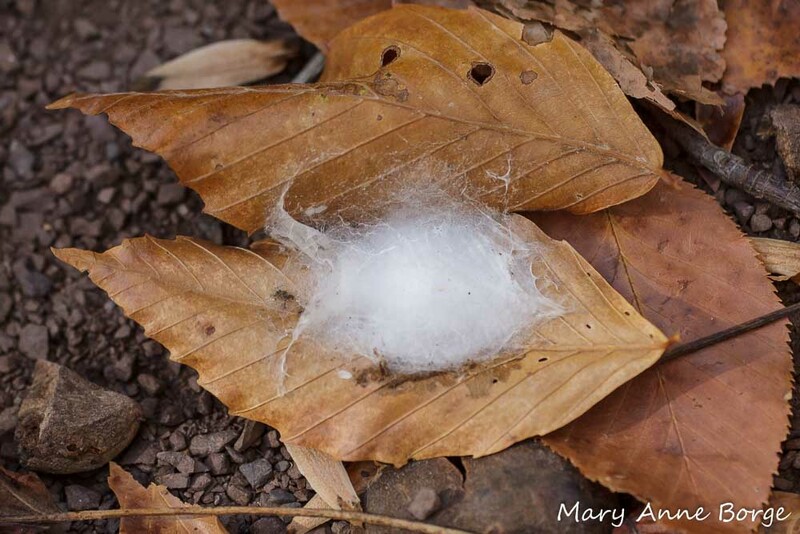 There is a fungus species that grows exclusively on the Woolly Beech Aphid’s honeydew, a sooty mold descriptively named Beech Aphid Poop-eater (Scorias spongiosa). Some studies have shown that leaves covered in sooty molds are more effective at removing pollution from the air than other leaves are. Oyster (Pleurotus ostreatus) and Burnt-Orange Bolete (Tylopilus ballouii) mushrooms, both edible, are among the other fungi that may be found on or near American Beech. 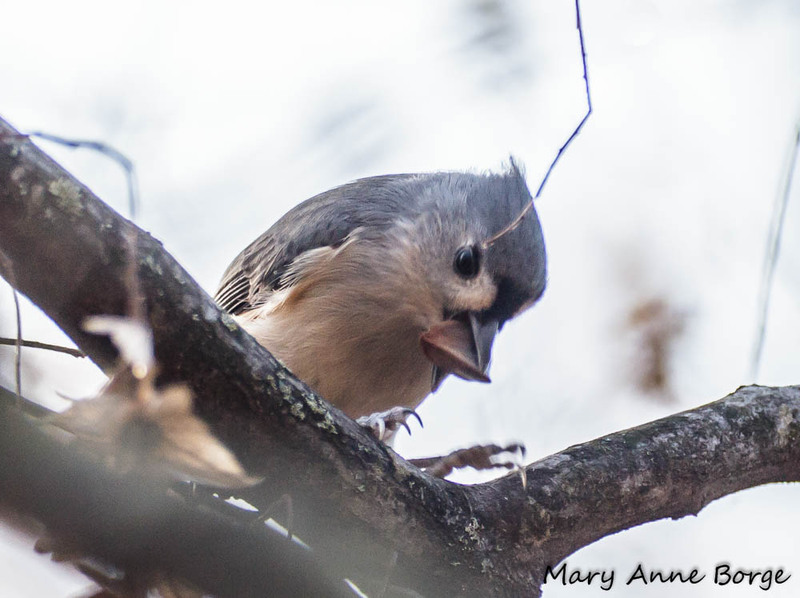 American Beech develops natural cavities that provide nesting sites for cavity nesting birds like Titmice, Chickadees, Woodpeckers and Nuthatches, all of whom rely on insects for a large part of their diet, and will help protect the tree from insect leaf-eaters. 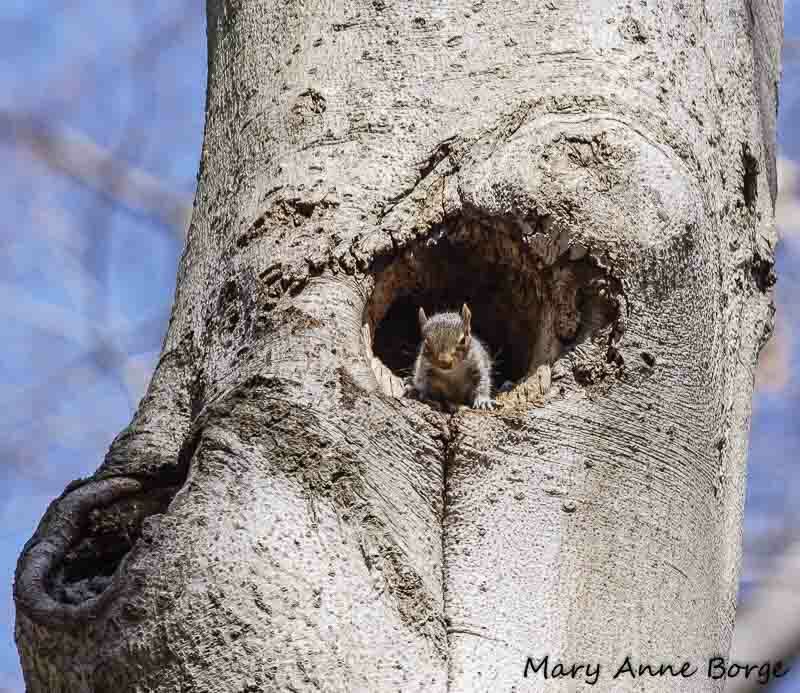 Chipmunks, squirrels, porcupines and other mammals also take advantage of the natural shelter American Beech offers. 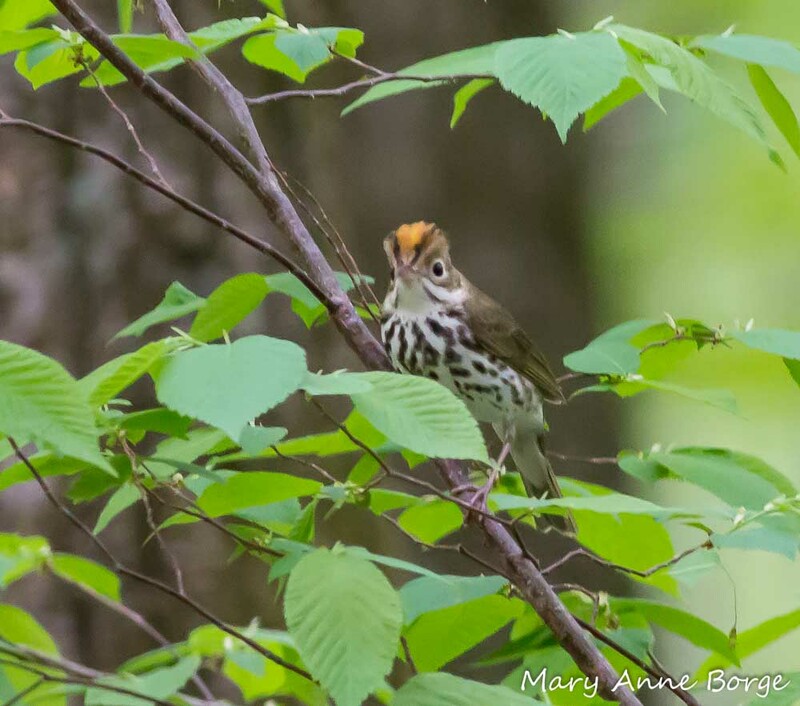 Other birds, like the Wood Thrush below, may nest on the limbs of American Beech, using some of the previous year’s fallen leaves as nesting material. 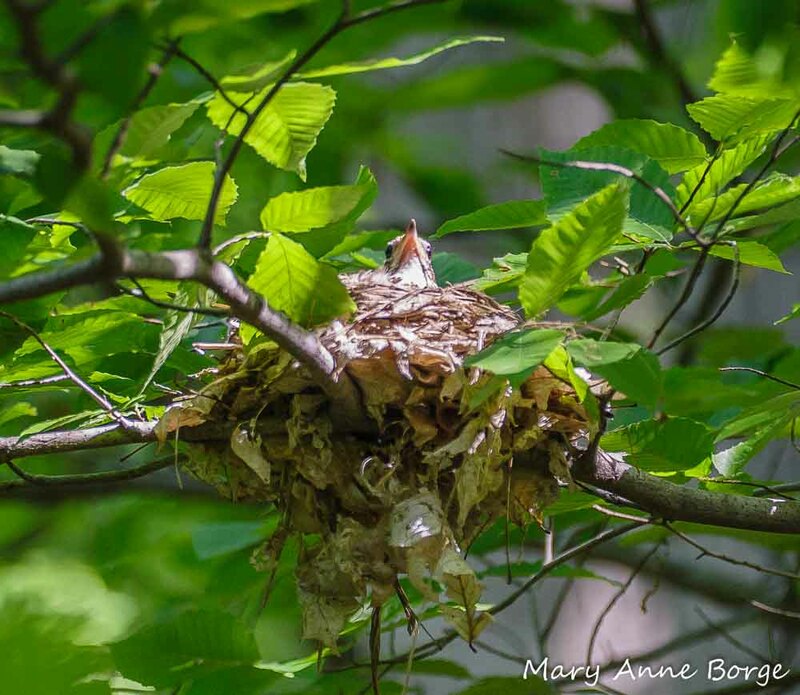 Wood Thrush on her nest in an American Beech. 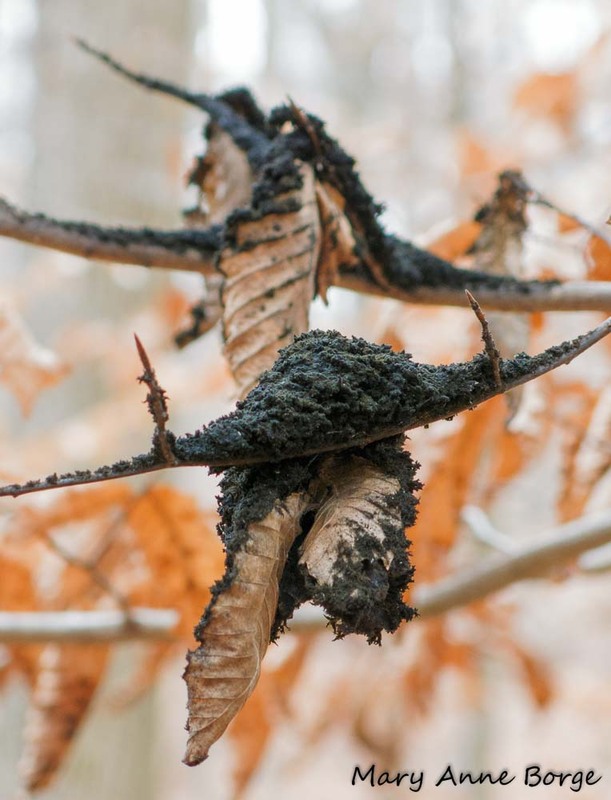 Some old Beech leaves have been used as nest material. 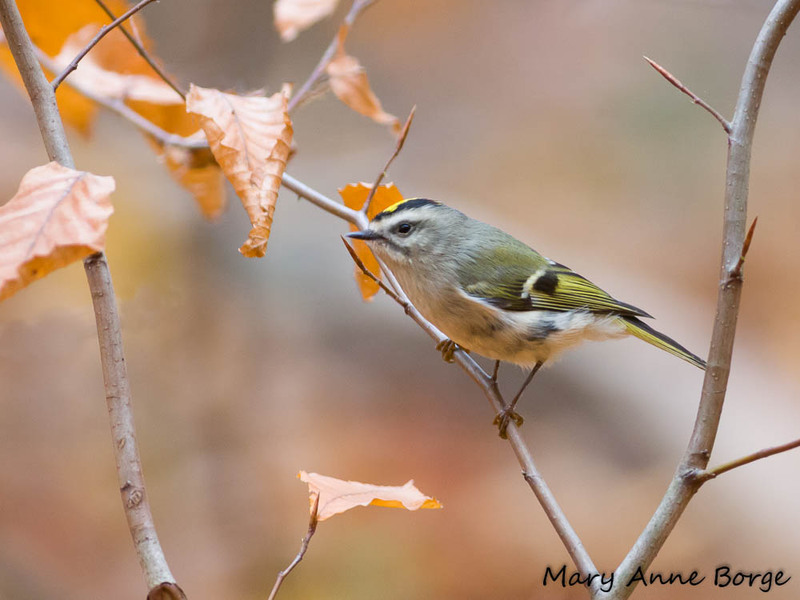 American Beech’s fallen leaves may offer insect protein for ground-feeders like the Ovenbird. Beechdrops (Epifagus virginiana) depends on American Beech for its survival, since it gets its food from the tree’s roots. 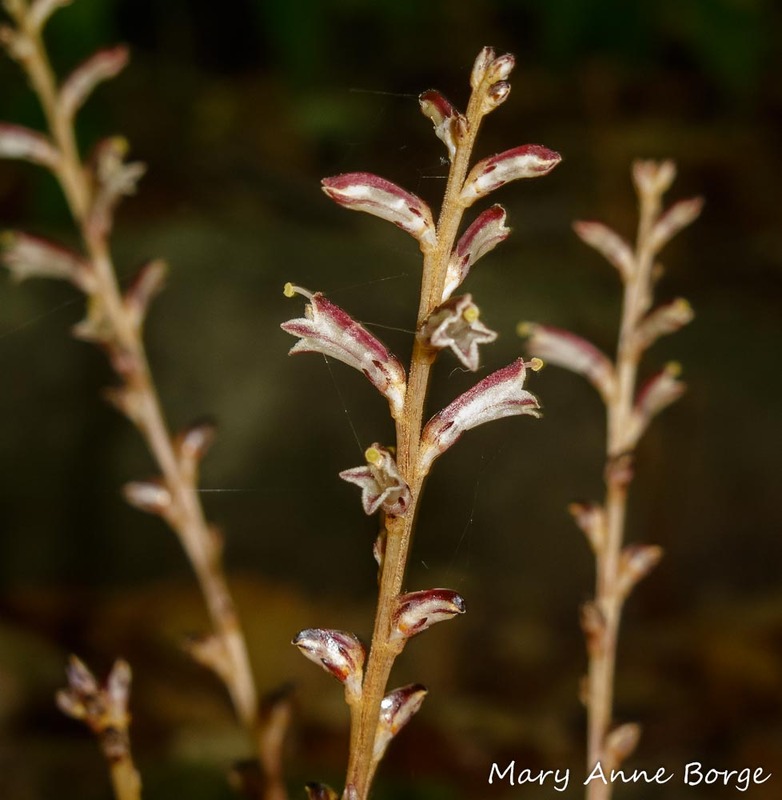 Look for the flowers in late summer or early fall, and the brown seed capsules throughout the winter. 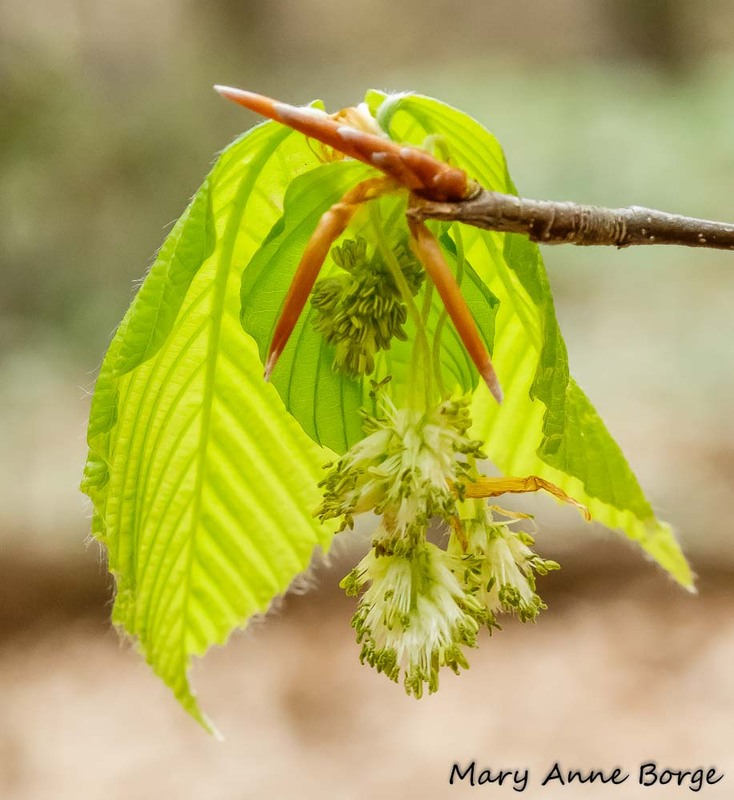 American Beech flowers are wind pollinated, with separate male and female flowers both on the same plant. They bloom as the leaves are opening. Nuts are produced if the flowers are successfully pollinated, usually 2 or 3 three-sided nuts per husk. The nuts are a source of high protein and fat for mammals and birds, including red, gray and flying squirrels, chipmunks, bears, Blue Jays, Tufted Titmice, Wild Turkey, and Ruffed and Spruce Grouse. 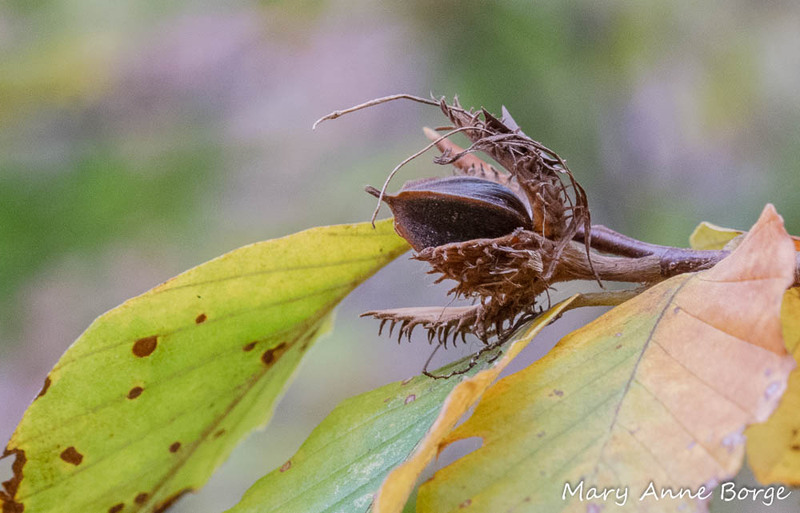 Nothing goes to waste in nature, so an empty beechnut husk may be reused as a shelter by an insect. As the nights get longer and the temperatures drop in the fall, the American Beech begins to prepare for winter. The leaves gradually stop producing chlorophyll, which reduces the green color visible in the leaves, revealing the yellows and oranges of carotenes, and the brown tannins, . American Beech is native in moist woodlands in the eastern United States and Canada. The bounty of insects supported along with its nutritious nuts makes it one of our most valuable tree species for wildlife. Wojtech, Michael. Bark A Field Guide to Trees of the Northeast. 2011.